Based on David Walliams’ original children’s book with illustrations by Tony Ross, The First Hippo on the Moon is an explosively funny space adventure which sees the enormously rich Hercules Waldorf-Franklin III and ingenious Shelia compete to be the first hippo to make it to the moon. Brought to life with puppets and music, the show is suitable for children aged 3 years and above. 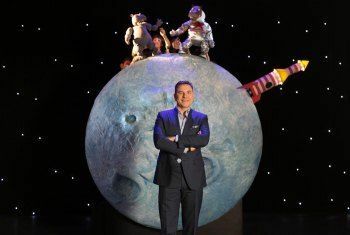 David Walliams has taken the literary world by storm and his brilliantly funny stories are adored by children the world over. He has achieved unprecedented critical acclaim and quickly developed a reputation as a natural successor to Roald Dahl. His books have been translated into over 45 languages and sold over 9.5 million copies in the UK alone. The First Hippo on the Moon has been adapted for the stage by acclaimed theatre company Les Enfants Terribles and Les Petits’ Artistic Director Oliver Lansley whose recent adaptations have included the immersive dining experience Dinner at the Twits and Alice’s Adventure’s Underground. The puppets have been created by Nick Barnes and Finn Caldwell who have previously collaborated on War Horse and The Lorax. Les Petits enjoyed huge success with their production of Captain Flinn and the Pirate Dinosaurs, they have also worked on Dr. Seuss’ The Lorax at The Old Vic and the National Theatre’s productions of Elephantom, War Horse and Raymond Briggs’ The Bear. Les Petits was set up as the sister company to Les Enfants Terribles whose work includes Dinner at the Twits, The Game’s Afoot, The Trench, The Vaudevillains and Olivier nominated Alice’s Adventures Underground.